Like so many 19th century buildings that were designed to be useful rather than decorative, the firehouse has dignity and style expressed in the simplest of terms - good proportions, big space and handsome woodwork - that are qualities difficult to duplicate today. 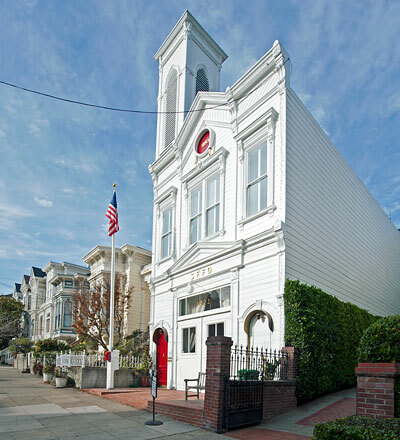 This firehouse is one of three constructed in 1893 which were designed by Henriksen and Mahoney; the other two were located at 1152 Oak Street (still standing) and 2545 Folsom Street (demolished). On June 22, 1893, the plans for the three firehouses were approved and transmitted to the Board of Supervisors. The architect Bernhardt E. Henriksen, a native San Franciscan, was described in the April 1884 issue of the California Architect and Building News as "the pioneer native born architect". Engine Company No. 23 was organized in 1894. A 1902 report states that the firehouse was refixed in 1899 and that the apparatus consisted of a third class La France engine and a Graves hose wagon which carried 750 feet of two inch hose. The company responded to alarms through the Richmond district and also in the area west of Laguna between Geary and the Bay. It was the first house in the Fire Department to use a three-horse hitch. The horses were replaced by engines in 1915. The structure was used as a firehouse until 1963, following which it was purchased by Mr. John Dickinson and converted into a studio and residence. In 1970 the restoration of many missing exterior architectural details was completed. Adapted from San Francisco Planning Commission Resolution dated 10 February 1977. GuardiansofTheCity.org is the definitive Web guide to San Francisco firehouses, both vintage and modern.